It’s an act of faith going fishing in a desert, but then sometimes one simply has to follow one’s heart (or gut for that matter) and take the plunge. 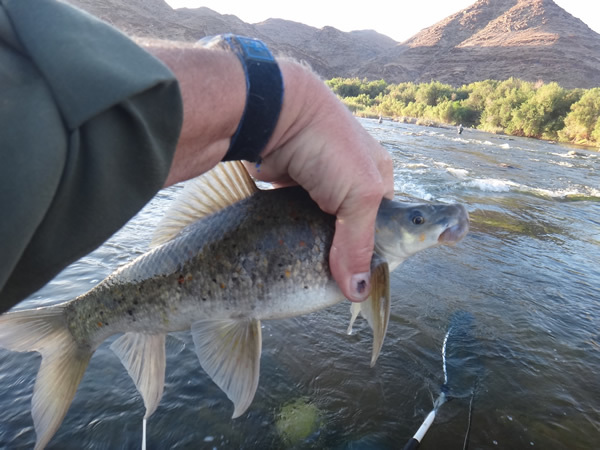 I have fished the Orange River flowing along the Namibian/South African Border for more than a few years and there is always the same mix of excitement and trepidation. Of course if you get it right it is wonderful, even, as with this past trip, spectacular, but then again there are plenty of things that can go wrong. If the water is high wading is limited, fishing less good and water clarity can be reduced to that of cocoa. The wind can howl, sandstorms can wreck the camp and dump grit on everything such that microscopic quartz crystals become a recognized condiment, sprinkled liberally over all that one eats. It is a long way off, remote with a capital “F”, and no matter how many times one undertakes the drive there is a point, under the desert sky without sign of water , that you feel something of a twit carrying a fly rod at all. When this is the view out of the window you wonder if bringing the fly rods was such a good idea. I have however spent enough time out in nature to know that the only certainty is if you don’t go you will miss out. Simply being there is an invitation for something wonderful to happen. This is one of those, fortunately numerous, venues where nature puts on the play and all you have to do to enjoy it is buy a ticket,a place where the motivation is fishing but in the end the rewards come from much more than that. Albe with a superbly conditioned Smallmouth, taken Euro-Nymphing in the rapids. Whilst out there this time we caught fish, a LOT of fish, something in the region of a hundred or more per man per day. We caught smallmouth and largemouth yellowfish, Kurper, Barbel (Catfish), and Mudfish. 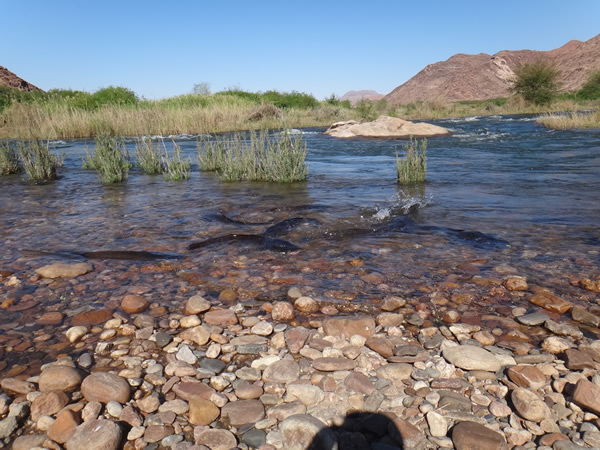 But we also saw Giant Kingfishers, African Fish Eagles, Herons, Otters, Scorpions, Social Weaver birds and a mindboggling mudfish spawn which left the river black writhing sexually charged bodies. 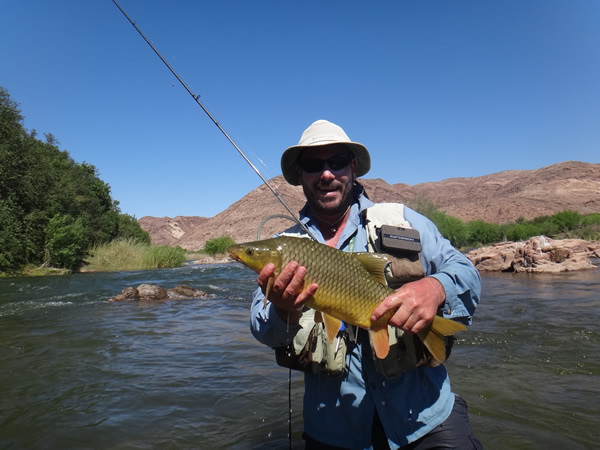 Orange River mudfish, most were too preoccupied to eat a fly. Odd to look at but they fight like hell. A baby largemouth Yellow, when he grows up he will be a serious predator. 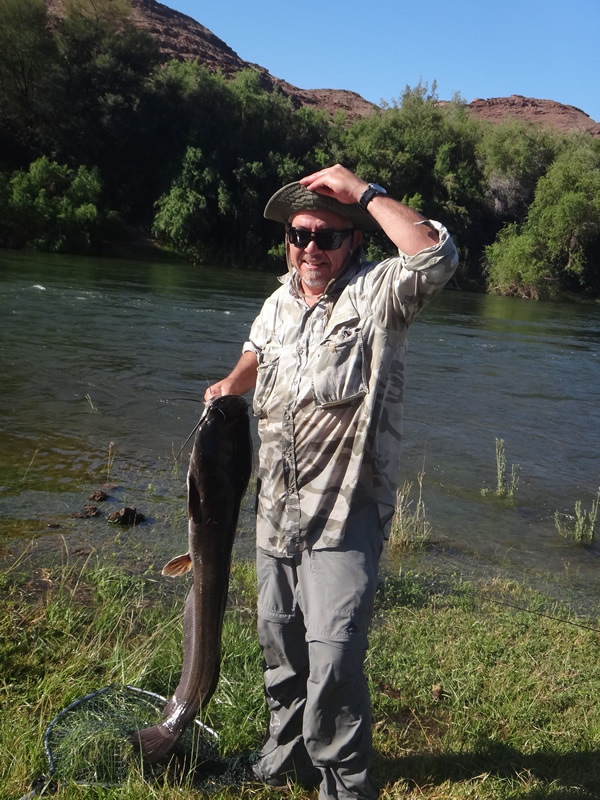 The barbel hunted the mudfish , so Mike hunted the barbel, seems fair. We watched barbell hunting the spawning muddies and in turn we hunted the barbell. We fished dry fly with success, French/Euro-nymph techniques, mono indicators, yarn indicators, Czech style and more and caught fish on all of them. We walked, waded and swam. Fell in , or at least I did (three times), my more sure footed colleagues managed to avoid the unplanned bath. 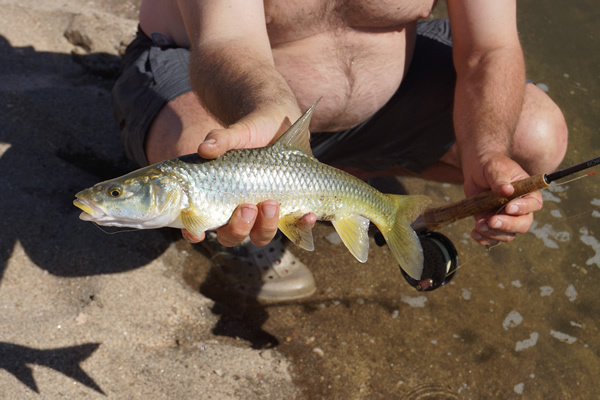 Barbel entered the shallowest of runs in pursuit of the spawning mudfish. The water levels rose and fell but all in all the clarity was beyond expectation, we sight-fished much of the time, something rare on this water, and we experimented. One of the great advantages of such a place is that there are plenty of fish and no pressure. So one can play with leader setups, indicators, techniques, flies and more. Before departure I was encouraged to take on this limitation, the idea? That you only fish other gear having first caught a yellowfish on an AFTMA #3 rod. For those not in the know, fishing for yellows is frequently a lot like fishing for grayling, but don’t make a mistake. These are “grayling” with an attitude and they can fight like demons, particularly in fast water. Such tackle as described above is generally viewed as seriously under gunned. Still we rose to the challenge and added our own corollary.. only 7X tippet. We didn’t intend to stick to that very long but as time passed and the fish count mounted it was hard to stop. The fine tippet provided exceptionally good sink rates on the nymphs and better bit detection such that in the end we fished much of the first day like this. Somewhere between 50 and 100 fish landed I changed up to 5x, just in case I hooked into something unstoppable. I didn’t however switch to the five weight outfit, not for the entire trip. Fishing with the lighter gear was just too pleasant. Better control and sensitivity, less weight in hand and a pleasure to fish. I really enjoy these outings, not simply for the fish but for the solitude, the abundance of nature around one and the opportunity to experiment. 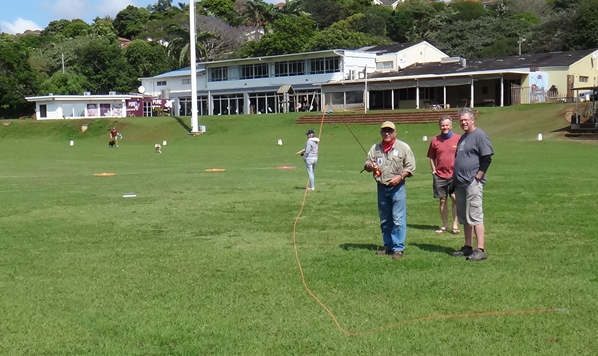 Guiding for trout in the Cape Streams one always has to consider the client and with that the simplest and most pragmatic means of hooking up. Here without such pressure one is free to play, change tippets, change leader setups, experiment with different mono, coil, yarn and mud type indicators. Sharing those experiments, innovations and theories with like-minded friends in such a spectacular environment, well that simply makes it all even better. So thanks to Mike and Albe for joining me; the days have passed, the fish have all been released and I have finally got the sand out of my fishing gear, but the memories will live on, and isn’t that one of the main reasons we go fishing in the first place? 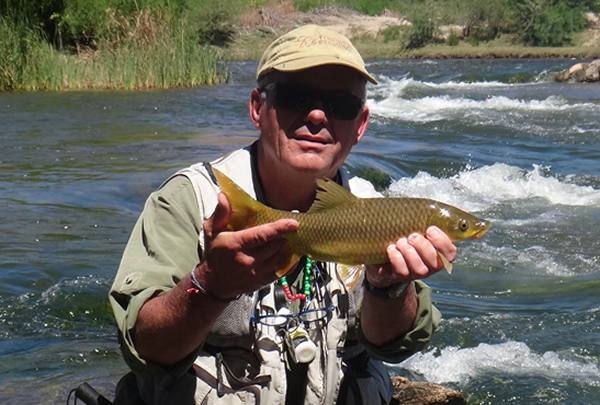 Our next planned excursion for yellowfish will be a hosted trip to the Bokong River in Lesotho (at the very top of this same river system) in February, staying at a superb camp run by Tourette Fishing and aiming to get some terrestrial dry fly action on large smallmouths in this crystal clear river. The Fishing Gene Blog has now received 67000 views over its lifetime, thank you to all those who read it and comment on it.